We all need a little sanctuary in our lives. A place where we can let down our walls, let the barriers fall and simply be ourselves, wrapped in the security and safety of knowing that we are held. My patron goddess, Nemetona, provides me with many opportunities to savour this precious moment, and to help create it for others. She is the Lady of Holding, of Sacred Space, of Sanctuary. Often when we meet others, especially human beings, our walls shoot up if they haven’t already been erected, and we are on the defensive. We regard others warily, perhaps even as enemies; guilty until proven innocent. A certain wariness around strangers makes sense – it’s an innate human instinct that we also see reflected elsewhere in the animal kingdom. It is a form of self-preservation. However, what I would posit is that we become so used to keeping those walls up, that we barricade ourselves inside our selves, unable to see the bigger picture, unable to truly experience compassion. I am not saying that we should allow others to do as they will to us – wilfully harming another person in any way is completely wrong. So often when I speak of compassion, people think it is an open invitation to be trod upon, to be used and abused by those who would seek to take advantage of us. Instead, I try to explain the ideas of compassion, and also of engaged Buddhism – simply put, compassion is about trying to understand, to see around our own sense of self into the bigger picture. Engaged Buddhism is being active in a world to stop suffering, to speak up against violence and injustice and work to spread love and compassion. My Lady Nemetona helps me with this. By coming into her sacred embrace, I find that I remember what it is like to be open, to be held, to be free in utter sanctuary. Thus inspired, I try to find ways to bring that inspiration out into the wider world, making it a better place. When we are held, when we are free to be our true selves, we also provide the opportunity for awen, for inspiration, to fill our souls with joy and wonder at the simplicity of simply being. We can then become a conduit for this energy, bringing about positive change in the world, even in the midst of suffering. Working with Nemetona, we become aware of our boundaries, when we erect them and when we let them dissolve. We also see how we involuntarily create barriers, whether it is in our energetic fields, our communication, or our perception. Through meditation and work with this particular goddess, I have found a way of both strengthening my inner sanctuary, thereby being able to let down those walls and openly experience situations with complete awareness. In this, intention is key. By being open, I am also being receptive to input that might otherwise pass me by through my own ego-centric mindlessness. By working with sanctuary, I can see where I have lapsed and allowed others to abuse my trust, and where I will never allow that to happen again. By being aware of how, why and who we engage with, and with what intention, we can change how we react to situation, acting with intention instead of a more reactionary type of living. By becoming engaged with my boundaries, I am aware of when I need to strengthen or release them as appropriate. It’s been a tough ride, sometimes, working with this goddess and with compassion. It has shown me where I have failed so many times in the past. Understanding and awareness of those failures, however, is not there to deter me; they are there to remind me, lessons learned and opportunities for further growth. The key to working with boundaries and compassion, and indeed Nemetona Herself, lies in awareness – of the self, of others and of the world at large. It’s not an easy path, but one well worth walking. It can lead us down the shadowy paths in the long dark night of the soul, but we can emerge into the light of the sacred forest grove, whether it be dappled sunlight, pale moonlight or starshine. In that emergence lies our true nature, inspired by nature and surrounded by our natural sanctuary. In that emergence lies our freedom. This excerpt deals with the relationship that I see between the two elusive goddesses of Elen and Nemetona…. I’ve always thought of Nemetona as a relation to the ever elusive goddess, Elen. The antlered goddess, Elen is currently undergoing a bit of a resurrection today, with more and more people discovering Her, though physical sources explaining Her and Her attributes are few and far between. 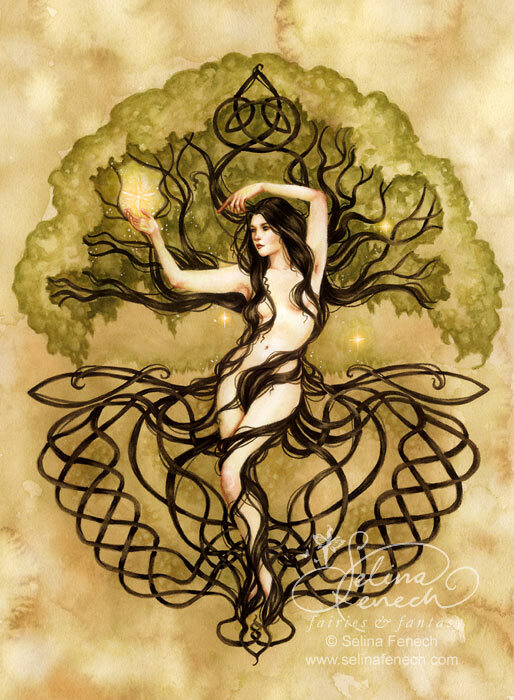 Elen is a wild goddess, found deep within the wood. Hidden in the shadows of the trees, she watches you with eyes millennia old. You may catch a brief glimpse of her, and then she is gone, flitting silent as ghost amidst the snowy boughs, disappearing in a heartbeat. She is the heartbeat of the wood, of the wild places, of heathland and moorland. She dances under the moon in star-filled skies, her dance exhilarating and free. And in the blink of an eye she is gone, lost in the mist that slowly curls over the land in eloquent drifts. Elen seems to have escaped the history books and academia of the human race. She knows this, and it pleases her greatly. You cannot know her without seeking her out, in the wild places, in the darkness and in the light, in the heat and in the cold. She is to be experienced, not to be read about. She is Elen of the Ways, of the trackways and paths that cross both nature and the human soul. She is a physical deity – you must put one foot in front of the other if you are ever to know her. If you are lucky, you can find the ancient pathways she had trod, leaving her energy behind, enticing you further, deeper into the heart of the wood, where the mysteries lie. Follow the footprints – in the snow, in the mud, in the sand. The cloven hoof of the deer will lead you to her. They are her children, they are Her. Like the deer, she is grace and strength, she is trusting and wary, she is capable of great stillness and explosive action. She is curious and wise, and she will beckon you further in if your heart is open. Even as Elen embodies the wild aspects of our souls, Nemetona is that which is held in deep reverence, in sanctuary. Elen runs wild and free throughout the forest, Nemetona holds that spirit safe within the bounds of her circle, the sacred glade at the heart of the wood. Both goddesses have very little academic and historical knowledge available about them – however both are very much present here in the British Isles, and indeed throughout the world. For me, Nemetona walks gracefully in the heart of the sacred grove, robed in natural linens, white limbs shining in the moonlight, her long dark hair flowing down her back. Elen runs free, flitting between the great trunks of the trees, ghostly as the deer, her limbs browned by the sun and her wild red hair tumbling free about her shoulders. Elen’s pathways often lead to Nemetona at the sacred heart of the wood. They often smile to each other, honouring each other and the sanctity of the sacredness of all things. For those lucky enough to physically have a sacred grove, a forest or woodland to go to on a regular basis, making that commitment to spend time in that very special place can be an excellent way to meet with Nemetona, and indeed her wilder sister, Elen. If you can, find a space where you can go as often as you can, to walk beneath the boughs, to become a part of the forest or wood. If there is a glade within the wood, so much the better – it doesn’t have to be big. Sit and meditate there, dance in the moonlight, make offering to Nemetona in order to establish that deep connection to Her in her sacred grove that words just cannot even begin to describe. Opening our nemeton requires a level of ability and trust. We close ourselves off on so many levels each and every day simply because of the sensory overload that we are exposed to through people, media and more. We have so many demands on our life that if a stranger came up to us in need after a hectic day, we may shut ourselves off completely from them and not provide the help that they might need, however simple and genuine their request may be. Our cat may come to us for a cuddle, and we don’t even notice as we are too busy distracting ourselves with television and high fat food. We switch off constantly, and we must relearn how not to do this, and instead be aware and mindful of our nemeton and how it interacts with others. I am writing on the computer upstairs, my fingers clacking the keyboard in the late evening sunshine. I vaguely hear my husband’s car as he drives down the street and into the driveway. Absorbed in my work, I don’t really hear the front door opening. He shouts “Hello!” as he enters – I mumble something incoherently as I try to keep my train of thought and the words spreading out onto the white computer screen in front of me. He comes up the stairs and I don’t even hear that. He enters the room, kissing my right cheek, then my left. His nemeton extends to wrap itself around me. And yet I withdraw, fully engaged in writing, and my nemeton snapping shut. He kisses the right side of my neck, then the left, and I am barely able to refrain from sighing aloud in frustration as I need to finish this piece. My nemeton, unbeknownst to me now, sends sparks of shooting energy, pushing him away. He kisses me once more, I cannot even remember where now, and then goes to sit on the bed where the cat has come in to greet him. I continue typing, getting it out, needing a last little bit of concentration. I have no knowledge yet of how I have dishonoured him and myself, and even the cat. As he sits on the bed and fusses the cat, I turn around and see his nemeton, a little wounded, withdrawn around his chest. But as he scratches the cat, and sees the bliss on her face, his soul opens to her little soul and once again his nemeton is where it should be, open and joyous in his own home. I apologise and stop typing, coming over to sit within his arms while together we stroke the cat and share in the embrace of Nemetona. Having danced deeply with the goddess Nemetona this winter, which has also inspired me to write my second book for Moon Books, the issue of boundaries returns again and again in relation to human interaction, in every day life with people that I share this journey with. Our own personal nemeton, that space around us that we do not allow anyone but those with whom we are most intimate with, expands and contracts with each person that we meet. Some we might shy away from, some we might fling our souls wide open to. What I have learned is that boundaries must be kept, in order to keep the nemeton intact. This is difficult for me, as I enjoy ecstatic relationship –I crave it in my Druidry, in my life. Yet I have learned with whom it is appropriate, and with whom it is not. To utterly dissolve into the moment of the sunset, or opening my soul to the bluebell wood as I lie beneath the gently swaying branches of oak and sycamore, or deep within the heart of ritual where transformation, celebration, integration take place – these are the times when it is not only appropriate, but relatively safe to do so. I know that the bluebell wood will not harm me, will not abuse the relationship. Sadly, this is often not the case with many humans that we meet. Perhaps that is why it is so much easier for me, as a Druid, to find relationship with the beech tree at the bottom of the garden, or the badger that comes looking for birdseed and peanuts, than the average human being. I have not been hurt by these creatures – even when my soul is laid bare, I have not come to harm. The seaside has not taken advantage of that moment when we are soul naked, seeking deep ecstatic relationship. Perhaps this is because the sea does not want, does not need as we humans need. Human relationship is so very different, for so much of it is heavily dependent on need, on desires. We seek a give and take in our relationships, if they are to be healthy. When there is not balance, it is unhealthy, and often advantage of another is occurring. Saddened by and a little wiser by past experiences, I have to relearn again and again where my edges are, and where they meet with others. Telling myself over and over again that I will not be hurt by certain people, or that I will allow love in from others – this is what is so very important. This is what Nemetona teaches me each and every day. By becoming aware of our own boundaries, we can then act honourably with other humans we meet, and indeed with all of nature. Sometimes it is wholly inappropriate to fling our souls open to the lake at moonrise – that is why in Druidry we ask permission to share our soul touch with others. Maybe this is what is lacking in much of human interaction – that permission is not sought. It is either given when not asked for, or taken even when it is not sought. In the midst of all this, all we do is dance with Her as best we can, sometimes ecstatically, sometimes deep within our boundaries, ever awake and aware of our relationship to Her and to the rest of the world. It had been a long and challenging day at work. I drive home, the windows open and the radio off, fully immersing myself in the act of driving, leaving behind what happened at work and becoming entirely aware of the present moment. I feel the sandy roads beneath the wheels, the smell of the newly ploughed fields lifting my heart and filling my nostrils with that sweet earthy scent. The village finally comes into view, the 30 mile an hour speed restriction delineating the edges of this space that I call home, and I slow down, driving under the speed limit through the little street past the village shop and post office, turning into my road. The tires crunch the rocks in my driveway, and I park the car, switching off the engine. I take a deep breath, and look at my home, smiling. Mindfully, I open the car door and grab my handbag, closing the door shut behind me and walking towards the front door, focusing on each and every step that brings me closer to Her. I take my keys out and with intent, turn the key in the lock and enter the porch, softly closing the door behind me. I take off my shoes and hang up my coat and then open the main door to the house. My soul opens of its own accord, my own nemeton relaxing and expanding so that it merges with the physical space of the house itself, with Her. I place my hand on the door lintel and whisper a prayer, “Thank you My Lady for this sacred place, this haven of four walls and for providing me with a home. I am truly honoured.” I feel the acceptance and smile, entering the home fully, saying hello to the cats and dropping my keys in the bowl. Our homes are often places of comfort and rest, if we feel inspired by Her to make them so and if we are attuned with Her energy. We must first have some sort of idea of who we are, in order to express ourselves and Her in our homes in order to create a sense of calm, well-being and a nurturing environment. We cannot simply emulate what we think looks nice in a book or a magazine, but we must feel it in our body, in our blood and in our mind that this is a reflection of what our vision of hearth and home is for us. It will be different for each person. Everyone has different views on aesthetics, décor, and arrangement. Everyone has different budgets and limitations. Everyone has different energies and inspirations and abilities to make these things manifest. What we must try to do is to do is to create that sense of welcoming when we walk in the door, to connect with Nemetona in our homes and to honour her for all that she provides. Every day is a chance to stop, to enter into ritual, to take a step back and simply savour the moment. We can become so out of tune with our own bodies, is it any wonder that other people often baffle us? By understanding our selves, we can better understand others, and so work to help others in a more positive and productive way. So we create the micro-retreat. Once a day, we stop, and take a moment to watch the moon, or sit on a cushion and meditate, to attune to our sense of self. When we find that centre point, that sense of self, we can then let it go, and seek out the deeper connections that can be found when the self is released. We are all living on this planet together, and by dropping that sense of self we can release into the flow that is awen, that is life and inspiration itself, flowing through space and time. It is a chance to connect with the earth, with deity, with everyone and everything on the planet, instead of just your own sense of self. How wonderful is that? I do not underestimate the significance of focusing on the self in order to improve one’s life – change must come from within. However, there is so much more to the world than the little universe we create around our sense of self – a brilliant world full of myriad possibilities. Take for instance the ability to shape-change – we must first be able to drop our sense of self in order to take wing as the marsh harrier, or stalk a pheasant through the underbrush like a fox. On a broader level, we can simply place our hands on the earth and feel all of life humming from this planet, but first we must silence the chattering self within in order to listen and to hear it fully, with an open heart. To be able to open ourselves up to the grander scheme of things, we must find a place where we are held, where it is easy for us to open up our nemeton and let go into the unknown. Creation of a sacred space is key for some – whether we physically create a space or whether we simply expand our own nemeton to that which we would connect, with honour and respect. We must first know where our edges are before we can release them and step over them into the unknown. In Zen, it is acknowledged that the sense of self is an illusion – it is made up of the opinions and experiences that resonate the most strongly within us, that we wish to cultivate, or which touch on on such a deep soul level. Yet these are all attachments, to which we must release in order to fully connect with the world at large. In the Ten Bulls, the seeker finally does manage to let go, to become one with everything, but more importantly, he then takes that back into the world and works in the world with that knowledge. Releasing into the void in order to connect fully takes great courage, great time and great skill. Yet it is so simple that it feels impossible. This is where discipline is key. We must make the time if we truly do want to do this. We must want it with all our heart and soul. In Zen, there is a saying that you must want it as much as a man whose head is held under water wants air. If you want it that much, you will make the time. Stepping away from the loudness and hectic pace of our modern lives we can find the time to simply “be”. We aren’t human beings most of the time; we are human doings. We must relearn that art of simply being which can then connect us to everything else. 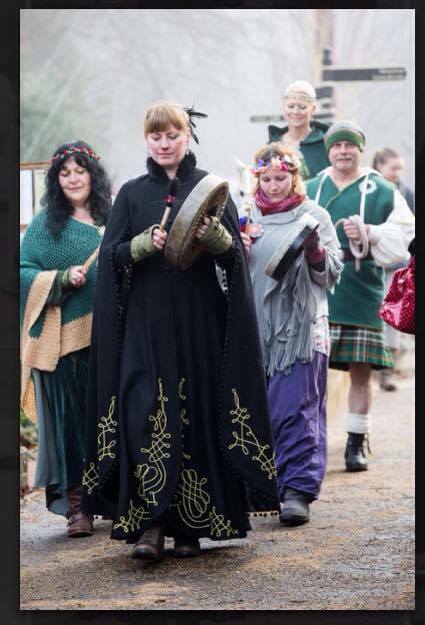 Once we simple “are”, then that sense of self fades away and the multitudes of awen around us are allowed to flow into and around us – we hear what in Druidry is known as “the song”. Take a micro-retreat, once a day, several times a day. Watch the sun rise and the sun set, and let go into that experience. The world is so much larger than you – why not experience it wholly and with reverence and honour? Weaving those dropped threads, you will become an integral part of the tapestry of life once again, and not just a loose thread dangling in the wind. Not going with the flow, but being the flow itself.